Today there was an air of anticipation for the day ahead, could this be the day we record our first victory on the current tour? 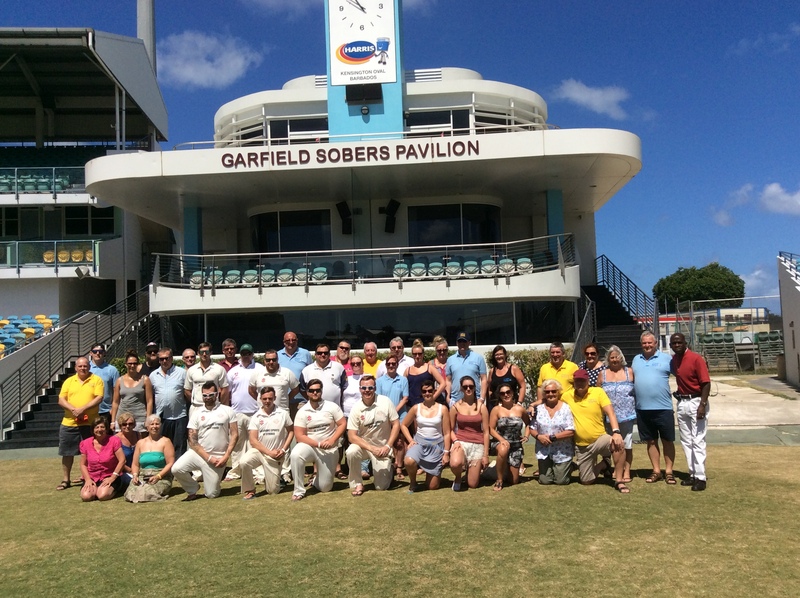 It was an earlier start for the trip up than normal as we had planned as a surprise to take a detour to the Kensington Oval for the purpose of capturing a team and group photograph. The authorities graciously allowed us entry and onto the playing area. 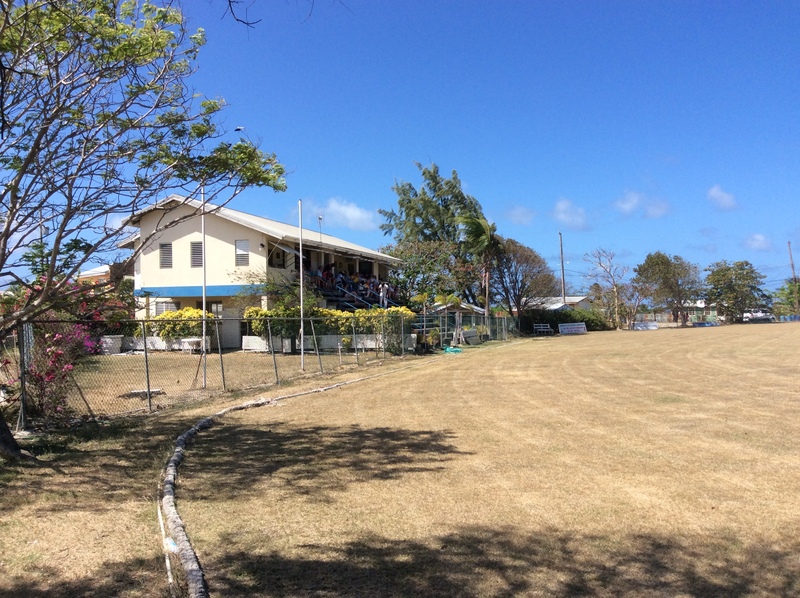 Whereupon we gathered in front of the Sir Garfield Sobers stand. Very many photos later we expressed our thanks and returned to the coach for the trip up the West Coast to Crab Hill. Sheldon our driver took to the microphone at every opportunity to point out places of interest along the route with real passion and pride. The drive was a sedate affair following the white knuckle rides of late. The good people of Crab Hill welcomed us into their club like long lost friends returning home. Indeed that is exactly how it felt to the many regulars who have strong friendships with so many here over the years. The lunchtime buffet they had laid on for us was second to none, a feast of sandwiches, meat, fish cakes, bread and cakes. All home made and superbly cooked and baked as well. In reply North Stars never really got on top of the Frocester bowling attack with the opening pair both exiting without troubling the scorer. A mini revival followed but never kicked on. North Stars were all out for 150 in the 22nd over. There were 2 wickets apiece for Richie Cave, Dan Cave and Ali Bray along the way. 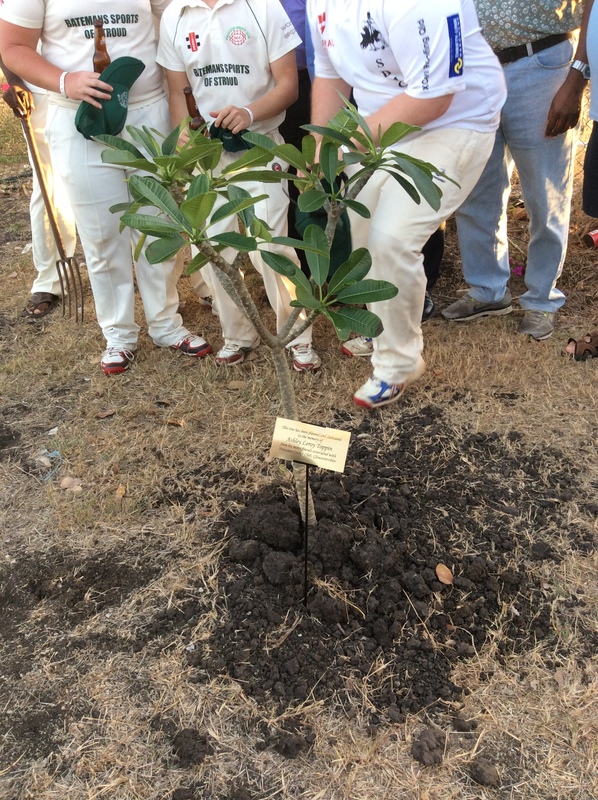 Imediately following the game there was a small but touching ceromony involving the planting of a Frangipani tree in memory of Ashley Toppin. 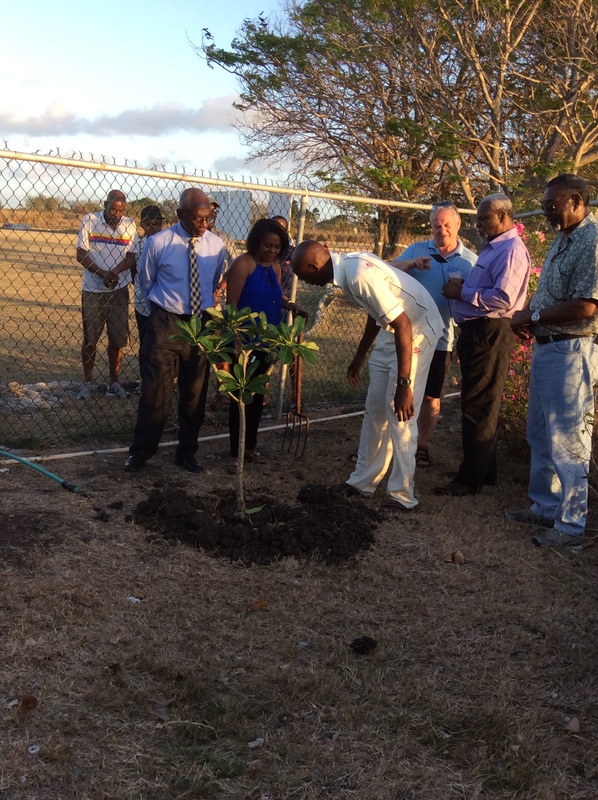 A few words were spoken, including some from West Indies legend Charlie Griffith, the tree was planted and a plaque was inserted into the ground. 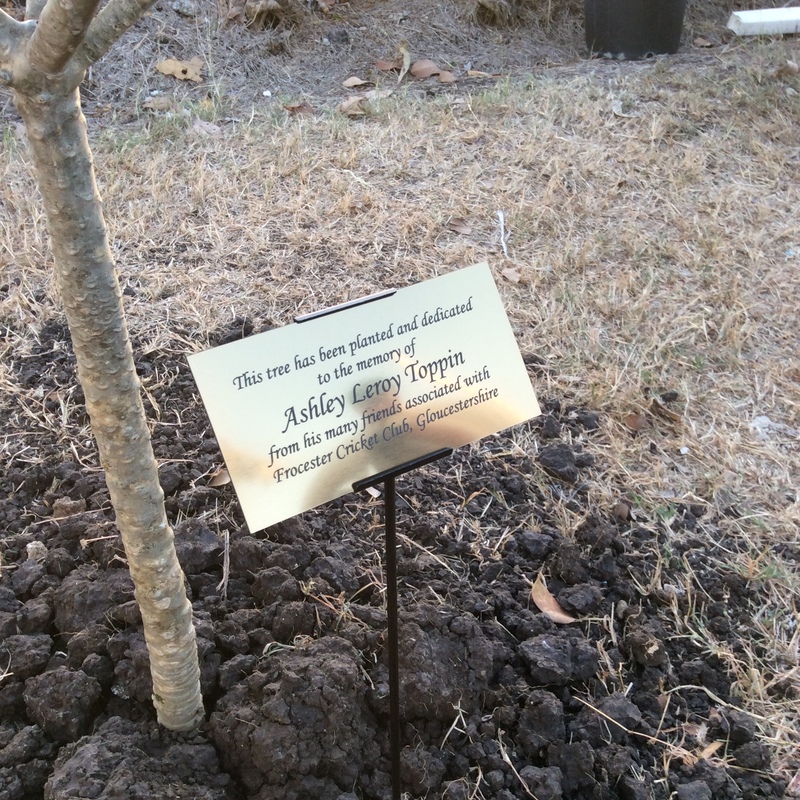 It was a special moment for those of us that knew Ashley and it seemed even more so from his many friends and colleagues at the North Stars club. What happened after all that will stay on tour, needless to say it involved a lot of food, alcohol and the obligatory singing. All outside on a warm Caribbean night with a lovely breeze cooling everyone down. The trip back was just as memorable with singing on both buses and even dancing in the aisles on the one. Fair to say all 3 games have been special for different reasons and a great time has been enjoyed at each. The cricket had improved each game culminating in a fine victory. The greatest joy however is the strengthening bonds of friendship we are privileged to enjoy with so many, both young and old, here on the most friendliest of islands. Well that’s it in terms of planned events with the exception of ‘fines night’ so the blog content will be less I am afraid. But who knows the unexpected always seems to happen at any moment so keep reading just in case. Mainly because that’s all the players that came Tony, I’ve no doubt you must have realised that. Hopefully next time we will encourage more to take the plunge and join us.